The Series VSCS is a double suction pump that has a vertically split casing shaft similar to the VSC. In this case, however, the suction inlet is horizontal, while the discharge remains vertical. This configuration is ideal for side-suction piping arrangements and maintains a small footprint with the discharge in the vertical configuration. Discharge connections range from 4 through 12. The VSCS has capacities over 9000 GPM with heads to 400 feet and motor requirements up to 600 HP. Available in bronze-fitted construction. Working pressures up to 300 psig. The bearings and mechanical seals can be replaced without removal of the rotating assembly, reducing the down time required for servicing of the pump. An ANSI-OSHA-compliant coupling guard shields the flexible coupler. A welded steel baseplate and internally flushed mechanical seals are standard features on this pump. Standard horizontal split-case pumps waste expensive floorspace. Not so with our VSC & VSCS Series. The VSC (vertical split case) and VSCS (vertical split case side suction) pumps are designed so they wont put the bite on your valuable square footage. 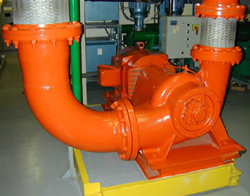 VSC and VSCS Series pumps can reduce installed floor area by 50%. That means savings of up to $80 a square foot in installation costs. Plus, they optimize the advantages of vertical piping applications by eliminating that tangle of elbows and supports required by horizontal split-case pumps. The VSC and VSCS Series pumps superbly fit even in very tight spaces.